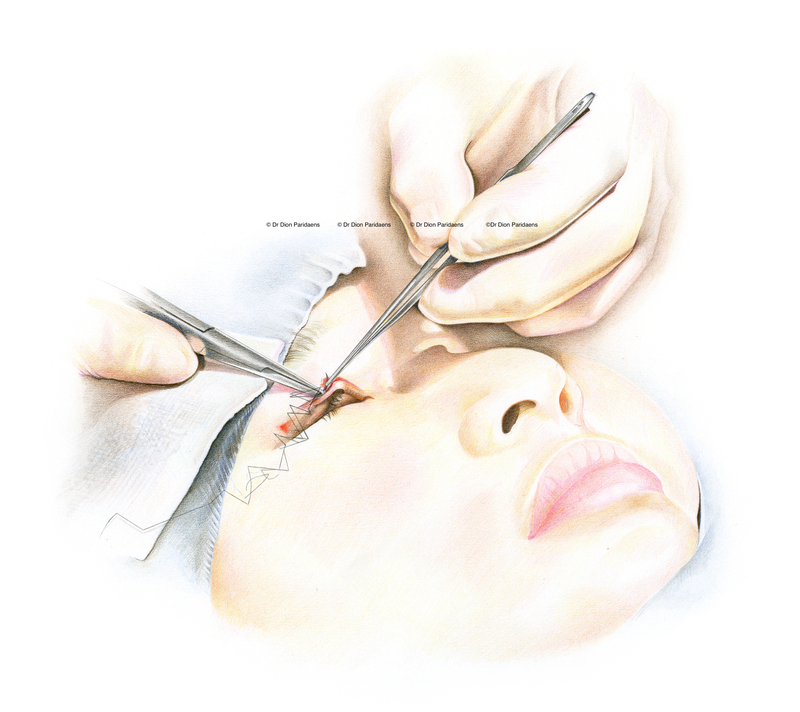 Asian eyelid surgery – what is it? Asian (East Asian) eyelid surgery, also known as “double eyelid surgery”, is a cosmetic surgical method to reconstruct the skin of the upper eyelid and often also to partially remove a surplus of skin. An eyelid crease can be made where it is naturally missing (also known as a “mono-lid”). 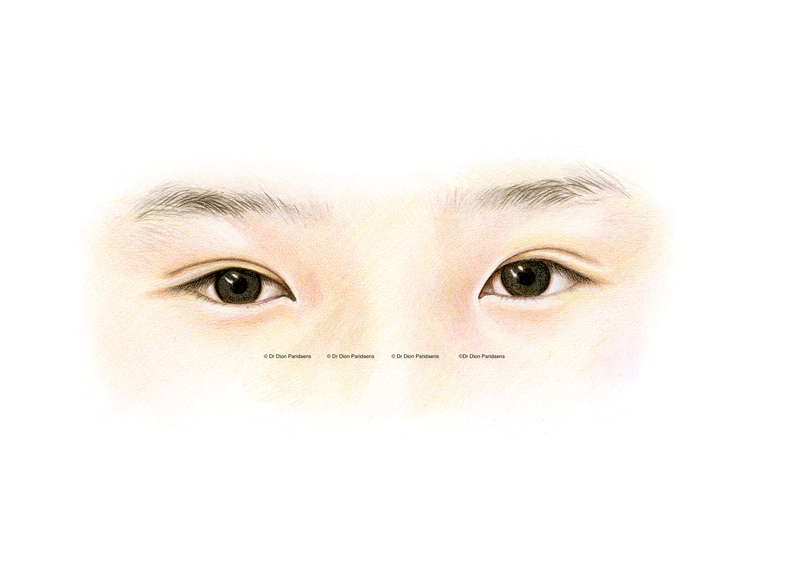 Asian upper eyelid – without skin fold. Preoperative image. Epicanthale folds on nose side upper eyelid. Asian upper eyelid – with skin fold. Postoperative image. The upper eyelid is a complex structure that primarily has the task to protect the eye, but also has a great influence on the appearance of the patient (energetic versus sleepy or tired look). The tarsus gives firmness to the upper eyelid and has important glands of Meibom, which provide the tear film with an oily substance (sebum), important for lubrication. 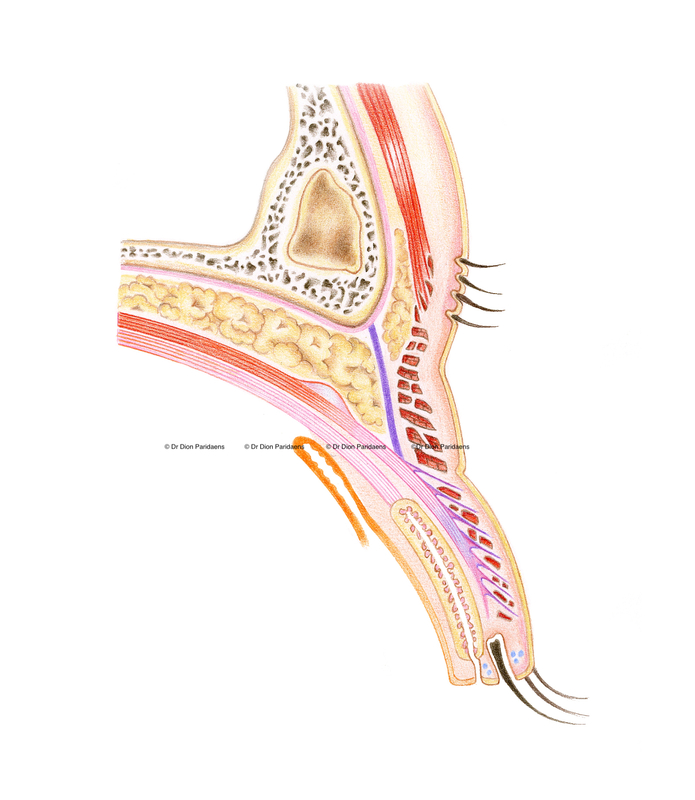 The levator muscle and the Muller muscle ensure that the eyelid can be lifted. The eyelashes protect against dust and insects and the like, the skin gives general protection at the front. 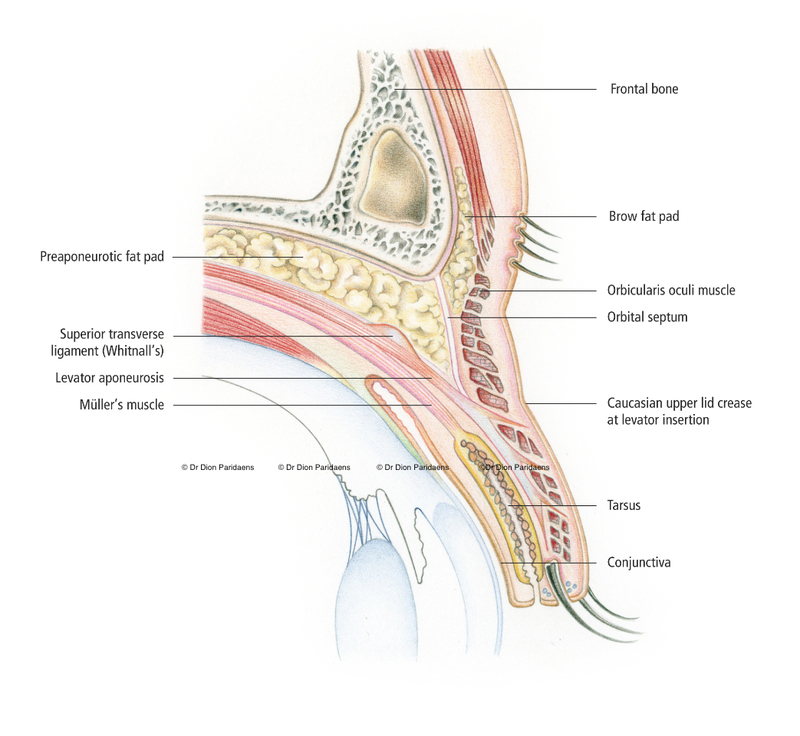 The sphincter muscle (M. Orbicularis) provides active eye closure and runs just below the skin. The orbital septum is an important barrier against infection. It also stops a bruise from going to the orbit. 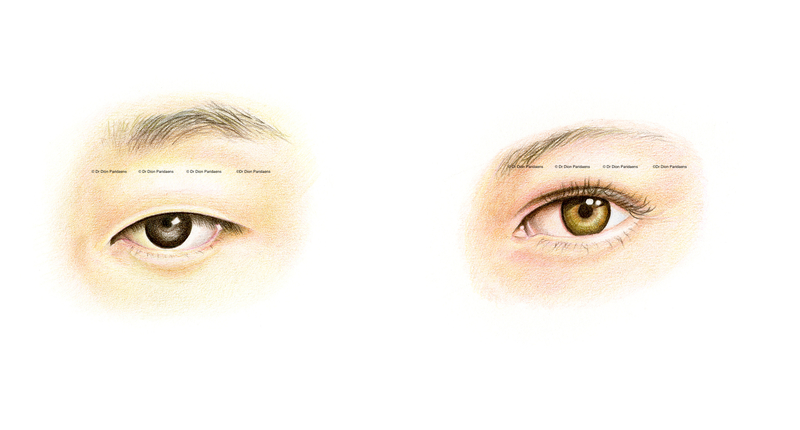 Anatomically speaking, there are a number of subtle differences in the upper eyelids of East Asians compared to the eyelids of Europeans and Sub-Saharan Africans. 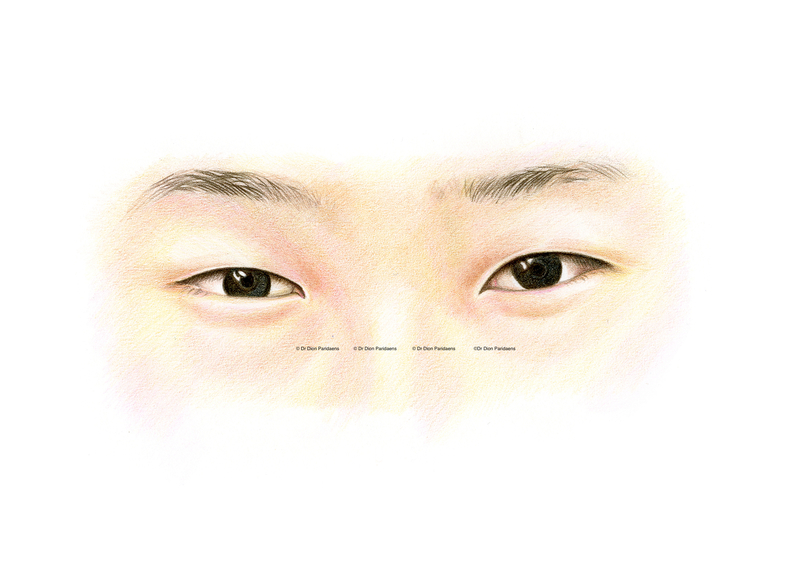 While some East Asians have a crease and some do not, there is also a large variation in the skin fold position of the upper eyelid in East Asia. The position of the upper eyelid skin fold can vary from 1 mm above the lash line to approximately 10 mm. A desire for change is very individual, but usually the goal is to obtain a more energetic, natural look. Cross-section through Asian upper eyelid. 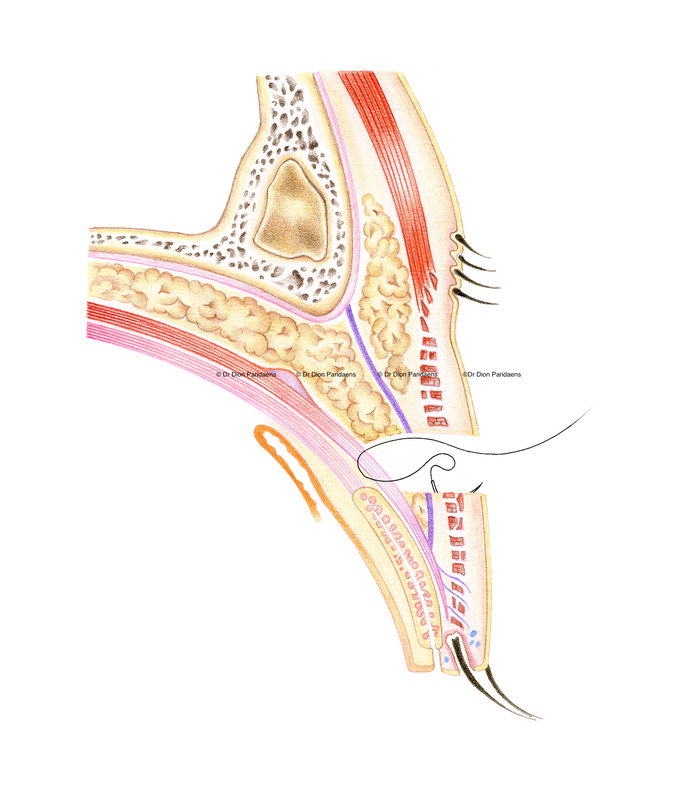 Notice the purple line, the connective tissue shot (septum orbital), which continues towards the eyelash base. Also the fat behind this shot extends downwards towards the eyelid lashes. Cross-section through Caucasian upper eyelid. 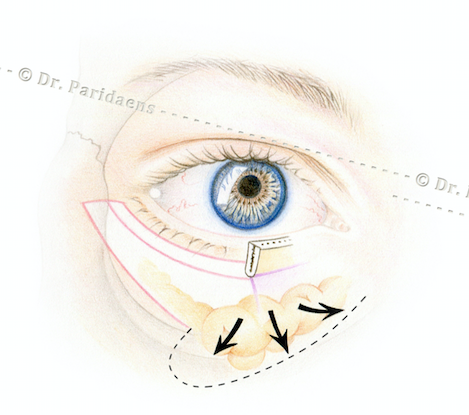 The purple line (connective tissue shot or septum orbital) inserts on the tendon of the eyelid lifter (levator muscle). At the level of this insertion, there are fibers between this tendon and the skin, resulting in a fold (crease), usually 8-10 mm above the lash line. It is important that the doctor who performs the procedure has special expertise in this area. Oculoplastic surgeons are ophthalmologists who specialize in eyelid surgery and who (like no other) understand the complex relationship between the eye and the eyelid. For example, an assessment of the different aspects of the eyelid such as eyelid height (the position of the lash line relative to the pupil), the amount of skin, the presence or absence of a so called eyelid cease (the line above which the skin fold forms) should be made preoperatively. The shape of the epicanthal fold, the position and shape of the eyebrow. It is also important to look for signs of dry (or wet) eyes. This helps to prevent eye complaints after the procedure. Photos from the past, around the age of 20-25 years, can give good indications of the natural aspect of the eyelids and eyebrows, so that too much tissue is removed and an unnatural appearance would occur. After careful evaluation of the upper eyelids and the eyelid features on old photographs and understanding the wishes of the patient, a marking is made on the eyelids at the desired location. Careful attention is paid to achieving symmetry between the upper eyelids, with dimensions being measured. This is followed several injections in the eyelids under monitored anesthesia. The eyes remain closed during the procedure. The skin surplus is surgically removed, and careful coagulation of the bloodvessels is done to prevent blue discoloration after the procedure. 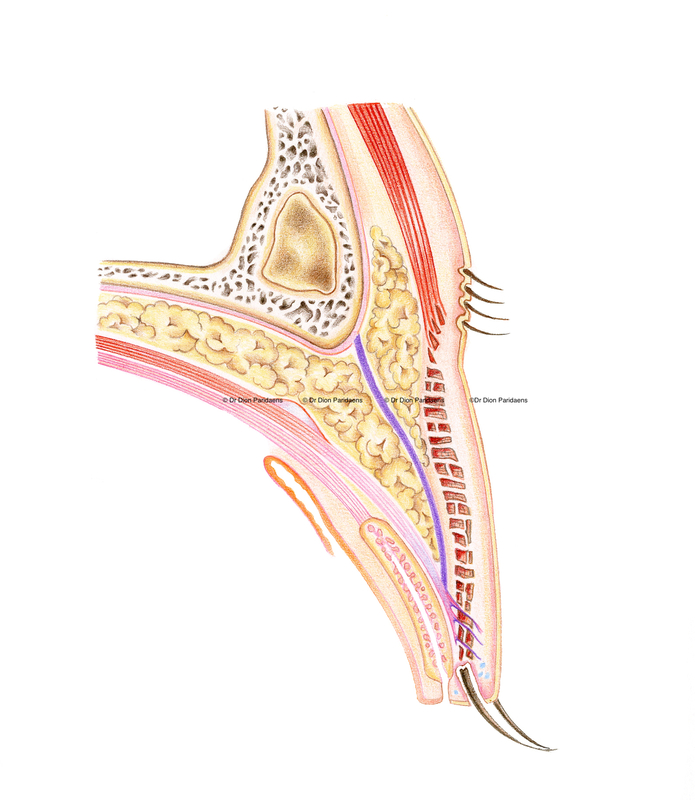 If a skin fold needs to be accentuated or made, this is done with soluble sutures. 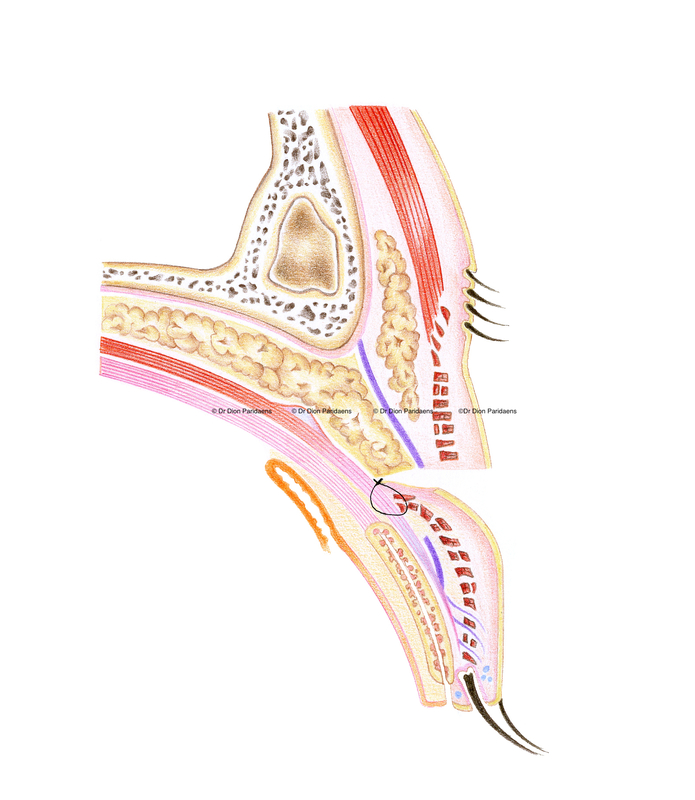 The skin is then closed with a continuous suture which can be removed after 5-7 days. The operation of both upper eyelids takes about 45 minutes, but with the marking, explanation and postoperative cooling, the client will be in the clinic for about 2 hours. The surgical team creates a pleasant and a relaxed atmosphere, where the client feels comfortable. In perioperative care, great importance is attached to avoiding pain and anxiety through various measures. Following the surgery, clients often comment that they prefer to undergo eyelid surgery to visiting their dentist. In the Focuskliniek Oogziekenhuis Rotterdam as well as the ELZA Clinic Zurich, there is extensive experience with eyelid surgery, including Asian eyelid surgery. Dr. Paridaens, oculoplastic surgeon, has done more than 35,000 oculoplastic procedures and patients from various countries with a desire for eyelid surgery have sought his help for surgical eyelid correction. He is also often asked by ophthalmologists and plastic surgeons to perform reconstructive operations following failed corrections elsewhere. The Focuskliniek team (Rotterdam) or the ELZA team (Switzerland) is happy to advise you further.